Crowborough Tennis and Squash Club boasts arguably some of the best courts and combined facilities in Sussex. We are constantly looking to maintain and improve these facilities and during the last year we have seen improvements to our shower facilities, improved lighting, new floors and court repainting. Much of this work could not have been carried out without the generous support of England Squash and Racketball. 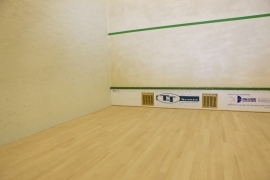 We have four Squash courts, one of which is a Championship glassback. All of our courts have optional heating for the cooler winter months. 3 of the courts have a spacious viewing gallery and easy access to our full bar and sweat bar area. On the ground floor adjacent to Courts 2 and 3 we have full changing facilities with hot showers. Our online court booking system allows courts to be booked up to ten days in advance and a touchscreen booking system is located in the bar area. All the necessary equipment is available from the reception. Please be reminded that only non marking indoor court shoes are permitted on court. Please ensure that your shoes are clean before going on court.